Energy company Chevron has been forced to suspend its plans to drill an exploration well for shale gas in the village of Pungesti, in eastern Romania, after the local community protested and blocked the company from entering the area for two months . In 2010, Chevron signed a deal with the Romanian government giving it leases for more than two million acres of land in Romania, which it says could hold enough shale gas to make Romania energy independent. In October 2013 Chevron wanted to begin its exploration in the village Pungesti, including around 357 buildings and 947 inhabitants (the commune includes eight villages: Armasoaia, Cursesti-Deal, CursestiVale, Hordila, Rapsa, Silistea, Stejaru, Toporasti). But the local community blocked the company's trucks from entering the area. The protests have had the backing of Orthodox priests and promised to be peaceful; villagers kneeled in the road chanting prayers and demands. On the week 14-20 October 2013, any of the village's inhabitants, most of whom were farmers, occupied the road leading into the fields earmarked for Chevron's construction site. They erected makeshift tents while those who had arrived by cart let their horses graze in the field. The police and gendarmerie increased their presence and created an exclusion zone for a while, preventing any other protesters from entering the area. When the trucks tried to move in, events turned violent: as the villagers formed a human chain across the road, the police moved in, pushing their way through the crowd. A man in his 70s was forced to the ground and trampled over and he was taken to hospital in critical condition. For more than two months, the villagers were spending their nights in the tents and cooking on open fires. Even as the weather turned and temperatures dropped below zero, they looked set to stick the winter out. On the 2 December 2013 the Romanian gendarmerie moved in to secure the way for Chevron's trucks. They occupied the village, blocking all access points with riot police vans and preventing anyone from leaving or entering for over 24 hours. Several villagers were detained and fined for the criminal offence of blocking a public road and many said that anyone leaving their homes was stopped for inquiring. With no journalists allowed entry at the time, details were vague, but local newspapers claim that between 30 and 40 people had been beaten by police and many villagers complained of brutality and injustice. Prime minister, Victor Ponta, responded to anti-fracking protests around the country by saying that "the actions of the gendarmes were 100% according to the law and I congratulate them for this." Maria-Nicoleta Andreescu, executive director of the Helsinki Committee Association for the defence of human rights in Romania, said: "There are important signs that indicate that the gendarmes' actions were at least abusive if not illegal. It is very clear that by restricting the access of the press in the area the authorities did not allow the public to be informed." In response to questions from the Guardian, Chevron said: "The company is committed to building constructive and positive relationships with the communities where we operate and we will continue our dialogue with the public, local communities and authorities on our projects." On 7 December 2013 the Police of Vaslui delimited a "special safety area" in the localities Silistea and Pungesti, where Chevron held a perimeter of 20.000 square meter, and by an order of the head of Municipal Police of Vaslui in the localities Silistea and Pungesti, as well as on the sector of county road which relates the two villages, it was significantly supplemented the number of patrolling order forces, mainly gendarmes. An activist in Bucharest, who acts as a liaison with people in Pungesti, said people in remote areas are now knowledgeable about the well-publicized problems like water pollution that opponents say fracking has caused in the United States and they are well-connected with a European network and international network. Although the situation varies from country to country, opponents to fracking are scoring successes. David L. Goldwyn, a former senior energy official at the U.S. Department of State, who has run workshops on shale gas for regulators, said companies are finding themselves in a difficult situation: “While they are still negotiating for licenses, the NGOs spin up local opposition,” he said, referring to nongovernmental organizations. “Before they have boots on the ground, protests are underway.” In fact in countries like Germany and France, fracking is forbidden. Even in Britain, where the national government favors shale gas exploitation, it has been more than two years since a company fracked a shale gas well. In Eastern Europe, national governments like those in Romania, Poland and Ukraine have given their assent, but some people in local communities have yet to be won over. Vlasa Mircia, the mayor of Pungesti, was one of the few locals in the Romanian village who openly welcomed exploratory shale gas drilling by Chevron and he was surprised about the protest. Some press even suspected there was Russian money behind fracking protests because Gazprom, a Russian state-controlled energy giant, has a clear interest to maintain countries dependent on Russian natural gas preventing the development of their own alternative supplies of energy. . These allegations have been condemned by local communities as a way to deviate true understanding of the situation and legitimate concerns. Chevron corporation on 20 February 2015 declared to finish its operations in Romania due to poor exploration results and prolonged protests by environmentalists. The withdrawal from the fracking project marked the end of the company’s shale gas exploration in Europe. Chevron’s departure left Romanian campaigners in a state of shock, since Chevron had only drilled one well in one of its four licence areas, which was definitely not sufficient to assess the potential of shale gas in Romania. In fact, for the anti-fracking campaign in Romania, Chevron’s departure signifies just a minor victory, but definitely not winning the war against fracking. Moreover the campaigners are suspecting the fact that behind Chevron’s move, there will be more companies drilling undisturbed to identify shale gas potential, such as OMV Petrom, Halliburton, Hunt Oil, Panfora Oil, NIS Petrol, Romgaz . Project Details Romania has been an oil and natural gas producer since the late 19th century. One of the first refineries in the world started operating in 1856 near the town of Ploiesti. But today, like its neighbors, it depends heavily on imported Russian gas. In neighboring Bulgaria, the Parliament, under pressure from protesters, imposed a ban in January 2012 on hydraulic fracturing, or fracking, the technology used to extract gas from shale. The ban caused cancellation of Chevron’s Bulgarian exploration permit and Romanian environmentalists hoped to emulate the Bulgarian example. The Romanian fight against fracking was part of a bigger movement that included opposition to controversial gold mine project Rosia Montana. Why? Explain briefly. 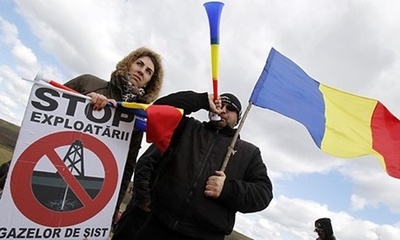 Chevron on 20 February 2015 declared to finish its operations in Romania due to poor exploration results and prolonged protests by environmentalists, so the protest was a succes against Chevron company. But anyway it's not a success against fracking because the anti-fracking campaigners are suspecting that behind Chevron’s move, there will be more companies drilling undisturbed to identify shale gas potential . 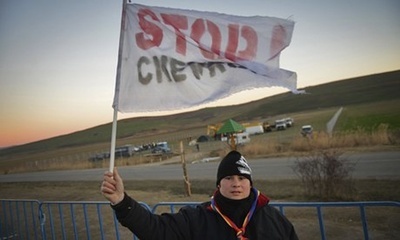 Luke-Dale Harris and Vlad Ursulean, Chevron suspends shale gas exploration plan in Romanian village after protest, The Guardian, October 21, 2013. Luke-Dale Harris and Vlad Ursulean, Police remove protesters from Chevron's fracking site in Romania, The Guardian, December 5,2013.